How can I finance my solar project? How is the cost of a solar energy system calculated? What rebates/incentives does the government offer for solar energy users? What is property assessed clean energy financing (PACE)? --You can pay your solar system with cash or taking out a solar loan. Counties and States provide multiple initiatives by offering rebates and discounts. 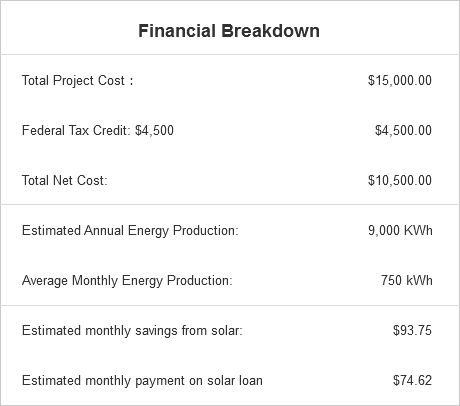 How is the cost of a solar energy system calculated? Solar electric systems are typically sold by the watt. For example, if you were to purchase a 5000 watt system at $3.00 per watt your cost would be $15,000. If you pay income taxes you can enjoy a 30% tax credit on the total cost of the system. On a $15,000 system the tax credit would be $4,500 making the net cost of your solar electric system $10,500. What rebates/incentives does the government offer for solar energy users? In the U.S, government incentives dramatically lower the cost of a solar project. Local, state, and federal governments all offer solar energy tax credits and rebates to encourage people to lower their energy usage and switch to renewable energy. The subsidy amount varies by program, but can cover up to 30% of your costs. The government also allows you to deduct 30% of your solar energy system costs off your federal taxes through an ITC - investment tax credit. Even if you do not owe any taxes this year, you can roll over your solar tax credit to the following year. What is property assessed clean energy financing (PACE)? Property assessed clean energy, or PACE, financing allows property owners to fund energy efficiency and renewable energy projects with little or no up-front costs. With PACE, residential and commercial property owners living within a participating district can finance up to 100% of their project and pay it back over time as a voluntary property tax assessment through their existing property tax bill. For further details concerning property eligibility (residential, commercial and municipal) and financing terms, contact the individual PACE provider in your area.